Imran Khan, the putative architect of a ‘New Pakistan,’ goes on making waves on both domestic and external fronts. Imran Khan, the putative architect of a ‘New Pakistan,’ goes on making waves on both domestic and external fronts. However, the going is tough and challenging on both counts even though the new Pakistani prime minister, used to facing daunting challenges on the cricket field, may refuse to be intimidated by a bumpy course in his first stint in power. Re-engaging India was Imran’s publicly pronounced priority in foreign relations. But the initial foray has been anything but reassuring, if not outright frustrating to him. His initiative on reactivating the Kartarpur border crossing with India and ensuring a visa-free entry into Pakistani territory for Sikh pilgrims to the Gurdwara Darbar Sahib did force New Delhi to reciprocate—in fact, pre-empt the Pakistani move. However, the gambit didn’t quite go the full length as Imran may have hoped for. Imran may have been overly sanguine about melting the long frost in relations between the two countries. His optimism gushed from his belief that he was unlike his predecessors in power. He wasn’t a traditional politician with little else but politics under his belt. He had a constituency among the Indians because of his previous career in cricket, which made millions in India his fans. He stood a better chance than them to cut the Gordian knot with India. That the Modi government isn’t inclined, at present, to bet its money on Imran is frustrating to the Pakistani PM. Indian External Affairs Minister Sushma Swaraj lost no time in dousing cold water on any expectations in Pakistan that Imran’s Kartarpur initiative would lead to early resumption of the long-stalled dialogue with India. Sushma was brutally frank in telling Pakistan that Kartarpur or no Kartarpur, her government wasn’t going to rush into talks with Imran’s Pakistan. So a reality check hasn’t taken long to sink in with Imran. India will not play ball with Pakistan because Modi sarkar has all its energies riveted on the upcoming elections in India, a few months from now. A South Asian cold war with a ‘nettlesome’ Pakistan will be a good card to wield in the election campaign. As the going gets tough for its prospects to gain another five years in power, the BJP may well have concluded that normalcy with Pakistan will not be an election-winning ploy. Imran must wait for the impending 2019 election outcome to rekindle any hope of a breakthrough with India. But serendipity may have suddenly brightened up chances of administering a healing touch to Pakistan’s frustratingly long-moribund, roller-coaster relations with Washington. It would be an understatement to say that since Donald Trump’s innings started in Washington, Pakistan has had one humiliation and frustration after another with his administration. It was only last month that a Twitter-addicted Trump administered another tongue-lashing to Pakistan. In a tweet out of the blue he accused Pakistan of being ungrateful and not doing “a damn” for Washington in return for billions poured into its coffers. But unlike his predecessors in power—who mostly meekly lumped Trump’s brazen insults and slurs—Imran refused to buckle under Trump’s verbal assault and gave it back, straight out, to him in his own medium. In several of his own tweets, Imran told Trump that Pakistan on his watch will do what was good for Pakistan and not what may please others.Although Imran denied in a recent interview with the Washington Post that he was in a Twitter war with Trump, his standing up to Trump’s bullying seems to have paid off, handsomely. Trump has unexpectedly decided to sue for peace with Imran. In a letter to him—which took Pakistani and American pundits by surprise—Trump has sought Pakistan’s help to find a negotiated end to the Afghanistan imbroglio. He has asked Imran to help by prevailing upon the Taliban to engage themselves in a dialogue to bring the long-festering episode to an end. Zalmay Khalilzad, Trump’s point man for Afghanistan, has visited Islamabad thrice in recent weeks to get Pakistan completely on board in the bid to get the Taliban fully engaged in the peace process. Pakistan’s foreign minister Shah Mehmood Qureshi has added another dimension to it: He would like to have India also involved in the peace process as a “shared responsibility” of regional countries. To the naysayers, Pakistan may seek to kill two birds with one stone. 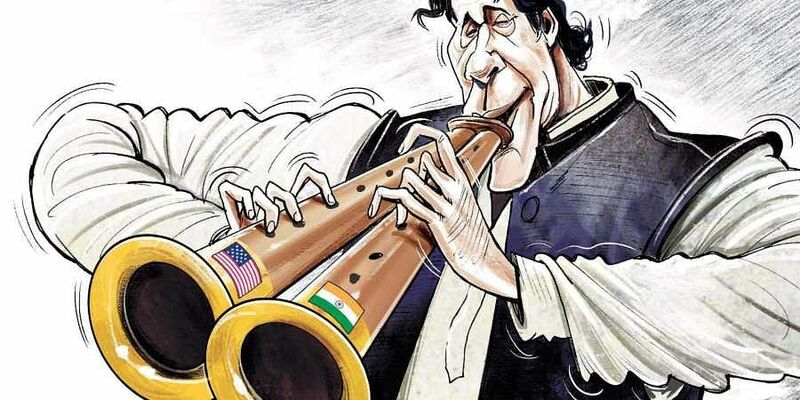 But the realists see a genuine effort by Imran to re-engage both India and US, constructively. It may not be a bad wish.